Vest are put on by lobbing over the head. 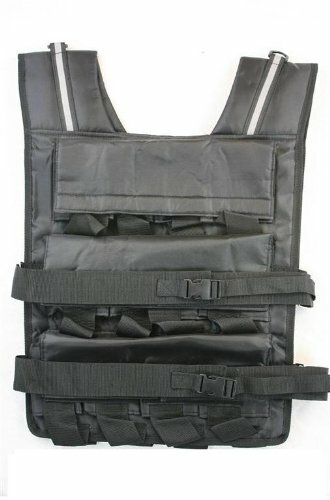 ---The vest uses 2 layers of nylon fabric with foam padding sandwiched inside for comfort. (This is important; some vest is made of nylon mesh or no padding. It is very uncomfortable) ---24 individual weight bag fit snugly in its own strapped pocket so it does not move around while moving. Our pocket is closed with Velcro that can force the weight bag tightly into the pockets. ---We uses iron ore sand that is dense and heavy - minimize the weights volume - They are double sealed. (One layer of thick plastic bag + 1 nylon bagging over it.) Note 1: Iron ore sand is different from the beach sand. Beach sand is light and made up primarily aluminum silicate. They are much lighter than iron ore sand. Note 2: Warning: 70 lb weight vest is very heavy. We do not suggest putting all 24 bags of the weights in the pockets and start your workout. The body has not adjust to the extra weights. Serious injury may occur. (The shoulder will hurt due to the weights. The legs will not have the strength to stablize the body. The back wil hurt and you will be out of breath and can not get out of the vest.) Please take at least few weeks before using the full load. We wish you have a good and save workout. 24 individual strapped in pockets. Vest has nylon shell with foam sandwiched inside. One Size fits all (for 170 to 300 lbs person) It may be too big for smaller frame person. If you have any questions about this product by Mountaineer, contact us by completing and submitting the form below. If you are looking for a specif part number, please include it with your message.